These fun water soaked, squishable, splat-able, sponge balls, are perfect for a hot summer day! Thanks to Martha for this great boredom buster. Use them for a game of tag, or as an alternative to water balloons. I found them to be fairly easy to make, although I did find a little bit of trouble when it came time to tie the knot around the sponge sticks to form the ball. But with the help of my hubby's finger holding the string down, I finally got it done. You'll need 3 sponges (1/2 inch x 2 3/4 inch x 4 1/4 inch) brand new, dry sponges. I found mine at the dollar store. 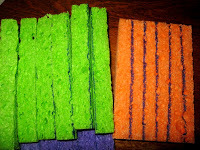 With a pen and ruler,( Use a washable marker, I didn't do that and should have) mark five (5) lines lengthwise on each sponge, spacing them 1/2 inch apart. 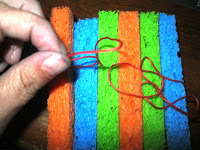 Use scissors to cut the sponge, using the lines as a guide, into six sponge sticks. shimmy a string underneath the stacks and tie off as tightly as you can in the middle of the stacks. 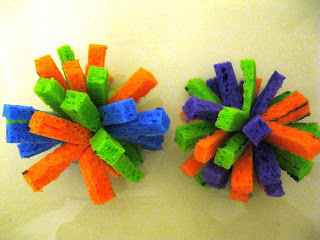 Fluff and squish your sponge into a ball shape, and immediately dunk it in water and splat your kids(or spouse)! ENJOY! Jan's tip: good ol' fashioned string or embroidery thread (which I used, 'cause it was easier to find at the moment), is the best. I tried fishing line, but that did not go well.